Early in 1961, Sam Swope saw the need for an industrial supply house in Chattanooga to supply expendable items to the construction, mining and manufacturing industries in the area. 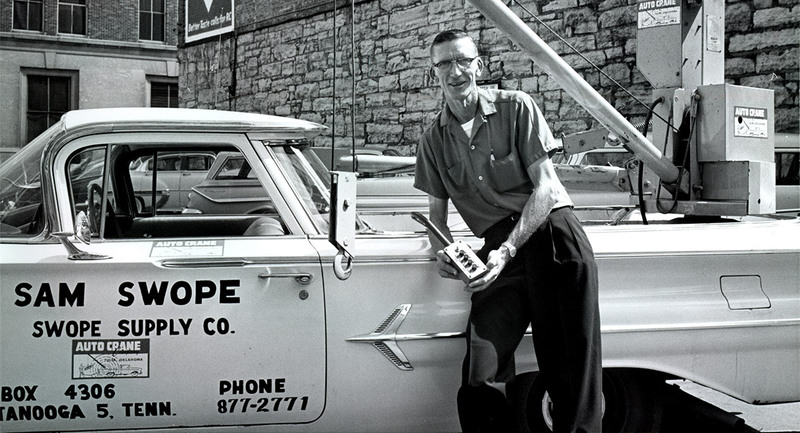 On July 1, 1961, after leaving his position in heavy equipment sales, he opened the doors for business at Swope Supply Company. As a one-man business with no inventory nor product to sell, the operation began in Mr. Swope's home in Red Bank. An automobile crane mounted on his white El Camino represented his first product and became his "trademark" as he traveled the tri-state area in his unique and memorable vehicle. Growth was steady and Mr. Swope leased 1200 square feet of warehouse space on W. 33rd St in Alton Park. This location housed the company's first employees and a small inventory of equipment, wire rope and parts. In only 6 years, the company outgrew the space and in 1967, a warehouse and office building were purchased. This location at 3000 Alton Park Boulevard is still where operations are handled today. The original business model, product lines and even names of the business have adapted over time to accomodate the changing economic climate. Swope Supply has, from the start, been truly a family endeavor. Sam's wife, Margaret, was instrumental in the bookkeeping side of the firm for many years. At one point, all three of the Swope's children worked for the company. Today, at the "new" 57-year-old family business, Sam's son and daughter, Terry Swope and Patricia Baker continue their father's legacy of integrity and outstanding customer service in the Chattanooga business arena. Sam's grandsons, Cam and Henry Swope, work side-by-side in a fast-paced environment that includes both large and small equipment rental and custom hydraulic and fluid lines for equipment and industry. Swope Equipment & Supply Company, Inc. is a member of the Better Business Bureau. © 2019 Swope Equipment & Supply Company, Inc. All Rights Reserved.